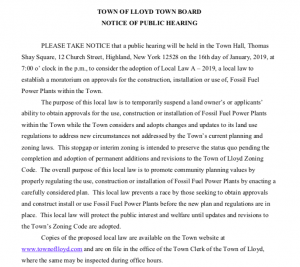 The moratorium in the Town of Lloyd, if adopted, would be the first community in the ‘G’ Zone to take such an action – and is a direct result of our webinar and hard efforts and teamwork of our wonderful coalition of partners. Thank you Town of Lloyd! Let their example provide a model for all other potentially impacted communities to follow suit. How to update your zoning language to prepare for a possible fossil fuel power plant proposal in your community. The proposed Glidepath Lincoln Park gas-fired power plant has revealed that the Mid-Hudson region is a target for new peaker plants. A complex of state regulations makes our region particularly attractive for power plant developers. Although we don’t need additional peak capacity here, the New Capacity Zone created by the Federal Energy Regulatory Commission in 2014 means that plants built in our region can be paid for providing backup capacity as if they were located downstate where the capacity is needed. At the same time, the hurdles to getting the necessary state air permits are lower here than they would be in downstate areas that are in “nonattainment” of federal air standards. Combine that with much lower land prices here than downstate, and our region has a bullseye on it. The Lincoln Park plant, if built, could be just the first of many across the region to take advantage of this perverse combination of regulations. We know that Glidepath has already contacted other communities, so it is urgent that communities prepare from a proposal like this. Power plants smaller than 25 MW in size are regulated by local land use law, rather than at the state level, but most communities do not have specific zoning in place for power plants. They often have language permitting “utility” structures, which Glidepath and other power plant companies may try to use to suggest that their plants are permitted uses, although this usage is usually intended to apply to distribution lines and other essential public infrastructure, not privately-owned power plants. 1. Review your existing code: Does it address power plants at all? Is it vague? Could a power plant potentially fit in to a “catch-all” permitted use? 2. Consider issuing a temporary moratorium while you develop zoning specific to power plants. Moratoria should always: have a valid public purpose, have a reasonable time frame, specify the time when the moratorium will expire, and strictly adhere to the procedure for adoption laid down by the enabling acts. 3. Decide if fossil fuel power plants should be allowed at all in your town. You may decide to exclude power plants entirely from your municipality. They have very different impacts than other kinds of facilities. Localities can ban industrial uses as long as prohibiting a use is a reasonable exercise of its police powers to prevent damage to the rights of others and to promote the interests of the community as a whole. 4. Develop new zoning code provisions with specific definitions and clear conditions for fossil fuel power plants, if you decide to permit them. ➢ A robust “purpose and intent” section with description of potential impacts of power plants on health, safety and welfare of residents of town. ➢ Require a special use permit and site plan approval, with appropriate conditions. ➢ Set criteria to address and mitigate potential impacts (i.e., screening requirements, stack height limits). ➢ Establish lot size and coverage limits, appropriate setbacks and building height limitations. ➢ Require all applicable additional permits and approvals. ➢ Require an enforceable plan and financial surety for decommissioning. The nature of the probable environmental impact, including a specification of the predictable adverse effect on the environment, public health and safety, aesthetics, scenic, historic and recreational value, forest and parks, air and water quality, fish and other marine wildlife. That the proposed facility conforms to and is in compliance with, all zoning laws,ordinances, rules and regulations of the Town. Town of Lloyd Moratorium on Fossil Fuel Power Plants Passes Unanimously.